Equipped with a 3.5-liter V6 engine as a standard feature in its base model, Nissan’s 2018 Maxima offers a smooth and powerful drive that ensures an enjoyable ride for drivers and passengers alike. It accelerates quickly--reaching 60 MPH in less than 6 seconds--and decelerates just as quickly, coming to a completely stop from a speed of 60 MPG in approximately 120 feet. 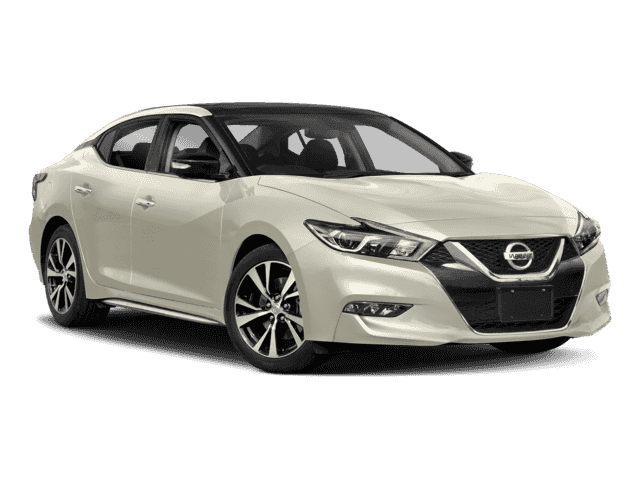 All 2018 Maxima models are equipped with front-wheel drive and a continuously variable transmission. Comfort and convenience are top priorities in the 2018 Nissan Maxima, which sets this sedan apart from other vehicles in its class that are equipped with as much power and luxury features as the Maxima. Inside, the 2018 Maxima truly feels like a luxury vehicle. Its upholstery looks sleek and classy, with a leather-wrapped steering wheel and optional leather seats. Multiple interior features designed for ultimate comfort and convenience make driving and riding in the 2018 Maxima much more enjoyable. Automatic climate control and a second-row vent keeps the inside temperature continuously pleasant for both the driver and all passengers. A heated steering wheel is an optional upgrade, along with cooled and heated front seats. The Maxima tops the charts in terms of available headroom and legroom in both rows of seating among similar vehicles within its class. It also offers plenty of cargo and storage space, with room for up to fifteen suitcases in the trunk when the second seat row is folded. The 2018 Maxima models also include a lot of interior storage, including a center-console bin, an extra-large glovebox, and eight cup holders placed throughout the car. Surprisingly efficient for the level of power it provides, the 2018 Maxima boasts an impressive fuel economy. The Maxima’s gas mileage reaches around 21 MPG on city streets and 30 MPG on the highway. Its combined mileage averages out to approximately 25 MPG overall. This mileage is significantly higher than that of many of its competitors in the class of full-size sedan vehicles. Nissan’s 2018 Maxima is equipped with some new features that were absent in the 2017 model. The 2018 model offers better, more advanced technology--most notably, it includes Android Auto in addition to Apple CarPlay as standard features in its base model. Two USB charging ports are also available as optional features in the backseat of the newest Maxima model. Safety features are improved in the 2018 Maxima. Automated emergency braking and forward collision warnings eventually became available as standard features in 2017, but all 2018 models--including the base model--were released with these modern safety features as standard. In terms of safety, the 2018 Nissan Maxima is well-renowned for its modern, technologically-advanced safety features that offer refreshing peace of mind to both drivers and passengers. Upon undergoing six different crash tests, the Maxima received top ratings from both the Insurance Institute for Highway Safety (IIHS) as well as the National Highway Traffic Safety Administration (NHTSA). Both of these reputable organizations are widely trusted to provide honest vehicle safety ratings to the public. Contemporary safety features of Nissan’s 2018 Maxima include forward collision warnings and automatic emergency braking, both of which are new standard features in all 2018 models. Upgraded 2018 models also include blind-spot monitoring, rear cross-traffic alerts, adaptive cruise control, a driver alertness system, moving object detection, and parking sensors in both the front and the rear of the vehicle. All of these safety features are designed to prevent accidents and collisions and keep both drivers and passengers safe at all times. A variety of technologically-advanced, modern navigation and infotainment features are standard in all 2018 Maxima models. An 8-inch infotainment touchscreen is built into the car. Its graphics are sharp and clear, and its response times are excellent. In terms of entertainment, Apple CarPlay and Bluetooth audio connection are both standard in the 2018 Maxima. USB ports and an AUX input for charging and playing music are also built in. Voice command capabilities, Bluetooth phone connection, as well as real-time traffic and weather updates help discourage distracted driving. Mobile WiFi and 4G LTE are optional features in upgraded Maxima models. Navigating is easy in the 2018 Maxima. Its advanced navigation system is linked with its infotainment display screen, so you can always see where you are and where you’re going. The screen shows you road maps as well as popular points of interest--like gas stations and restaurants--to help you orient yourself and get where you need to go. Voice-guided directions are also built into the infotainment system. Simultaneously sporty, luxurious, and practical, the 2018 Nissan Maxima offers a driving experience that is as distinctive as its style. It is powerful, fun to drive, roomy and comfortable, and convenient. Its advanced modern technology, excellent fuel economy, comfortable interior, and powerful engine make Nissan’s 2018 Maxima a popular choice for a wide range of drivers who are in the market for a full-size sedan.